The Labrador Retriever is the most popular dog in America. It's one of the most easily trained dogs and can be very obedient and friendly. It's not surprising that it's so popular, it's one of the best dogs around children, other pets and even strangers. It's a good calm indoor dog and a playful yard dog. It can be a good companion for running and fooling around outside. They are eager to please which makes training easy. Labrador Retrievers need a lot of exercise. They love to retrieve, hence the name and they love to swim. They will be happy for hours fetching a stick thrown into the water. They need physical and mental challenges to keep them busy. If they do not have enough to keep them occupied, they can get into trouble. They are known to roam around and chew on things when they are bored, so if you are not willing to provide them with enough exercise and attention its probably not the right dog for you. Labrador Retrievers are easily trained but seek leadership from its owners. They need to feel like part of the family and need physical and mental exercise to be kept from being destructive. They can take some time to mature into adults, so they require time and patience. The Labrador Retriever is one of the most active dogs. It requires plenty of daily exercise to keep it out of mischief. Obviously it enjoys retrieving the most. It loves to play fetch and if you are near a water source like a beach or large outdoor pool, it loves water too. Plenty of running and walking is also good for the Lab. Labrador's coats shed water very easily. Hair does however die off and get stuck. You should brush their coat to remove this dead hair once a week to keep it in good condition. Lab's can live in colder and hotter climates but they do best living inside with their family. Keep your Labrador out of extreme cold or hot temperatures, as it could be dangerous. 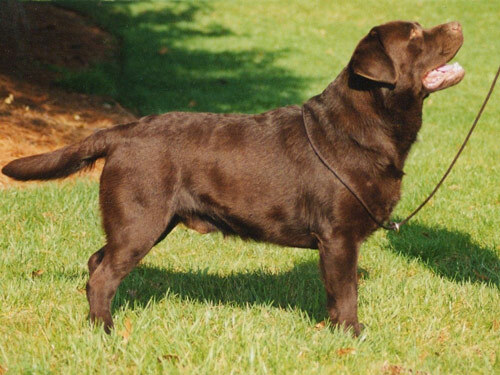 There are several health concerns that you should be aware of when owning a Labrador Retriever: Major concerns include CHD, elbow dysplasia, OCD, obesity and patellar luxation. Minor concerns include cataract, CPRA, hot spots, retinal dysplasia and hypothyroidism. Occasionally seen are diabetes, entropion, distichiasis, tricuspid valve dysplasia, muscular dystrophy and exercise-induced collapse. Recommended tests are hip, elbow, eye and knee. The average life expectancy for a Labrador Retriever is 10-12 years. Originally Labrador Retrievers were from Newfoundland. In the early 1800's a smaller version of the Labrador Retriever, called the St. Johns Newfoundland was popular. They were used to retrieve game and fish. They were used for many different tasks that involved being in the water. This breed eventually died off because of a heavy dog tax. A group of Labrador's were taken to England in the early 1800's and there the breed crossed with other retrievers and continued. They were used to capture upload game and their reputation as the best retrievers spread. Black was the only acceptable color until the early 1900's when yellow and chocolate colors were acceptable. The breed was recognized by the AKC in 1917. It became the most popular breed in America in 1991 and has remained there until today. Labrador Retriever puppies and adoption are highly sought after. They usually do not last long.